See also: District of Columbia home rule and History of Washington, D.C. Under the U.S. Constitution, the District remains under the jurisdiction of Congress. However, at various times in the district's history, Congress has devolved some of its authority to District residents and their elected representatives. 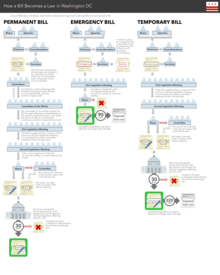 The possible paths of bills, emergencies, and temporaries through the power structure of the District of Columbia as dictated by the Home Rule act. When Congress passed the Residence Act on July 16, 1790, they called for a new permanent capital of the United States to be located on the Potomac River. The federal district originally comprised land in the form of a square measuring 10 miles (16 km) on each side donated by the states of Maryland and Virginia. The Residence Act also provided for the selection of a three-member board of commissioners, appointed by the President, charged with overseeing the construction of the new capital. Two other incorporated cities that predated the establishment of the District were also included within the new federal territory: Georgetown, founded in 1751, and the City of Alexandria, Virginia, founded in 1749. A new "federal city" called the City of Washington was then constructed on the north bank of the Potomac, to the east of the established settlement at Georgetown. In 1800, Congress created a joint commission to recommend the governance for what was then called the Territory of Columbia. The joint commission recommended a governorship and a 25-member legislative assembly. This would have been the federal district's first legislature. However, the Organic Act of 1801 officially organized the entire federal territory under the control of Congress, but did not establish an overarching government for the entire District as recommended. In 1802, the original board of commissioners was disbanded and the City of Washington was officially incorporated. The city's incorporation allowed for a local municipal government consisting of a mayor appointed by the President and an elected six-member council. The local governments of Georgetown and Alexandria were also left intact. In 1820, the Congress granted the City of Washington a new charter, which allowed for an elected mayor. This piecemeal governmental structure remained essentially intact until the passage of the Organic Act of 1871, which created a new government for the entire District of Columbia. This Act effectively combined the City of Washington, Georgetown, and unincorporated area known then as Washington County, into a single municipality as Washington, D.C. exists today. In the same Organic Act, Congress created a territorial government which consisted of a legislative assembly with an upper-house composed of eleven council members appointed by the President and a 22-member house of delegates elected by the people, as well as an appointed Board of Public Works charged with modernizing the city. In 1873, President Ulysses S. Grant appointed the board's most influential member, Alexander Robey Shepherd, to the new post of governor. Shepherd authorized large-scale projects to modernize Washington but overspent three times the approved budget, bankrupting the city. In 1874, Congress abolished the District's local government in favor of direct rule. The territorial government was replaced by a three-member Board of Commissioners; two members appointed by the President after approval by the Senate and a third member was selected from the United States Army Corps of Engineers. One of the three members would be selected to act as President of the Board. This form of government continued for nearly a century. Between 1948 and 1966, six bills were introduced in Congress to provide some form of home rule, but none ever passed. The commissioner form of government was replaced in 1967 by a mayor-commissioner and a nine-member city council appointed by the President. Due to public pressure and the demands of handling the complex day-to-day affairs of the district, Congress eventually agreed to devolve certain powers over the District to an elected local government. However, lawmakers in Congress during the early 1970s had originally sought to re-institute the post of governor and create a 25-member legislative assembly. Local officials opposed this form of government, insisting that the District's status as a municipality be respected. On December 24, 1973, Congress obliged the demands of local residents and enacted the District of Columbia Home Rule Act, providing for an elected Mayor and the 13-member Council of the District of Columbia. The Council has the ability to pass local laws and ordinances. However, pursuant to the Home Rule Act all legislation passed by the D.C. government, including the district's local budget, remains subject to the approval of Congress. After signing the bill, President Richard Nixon said, "I believe the legislation skillfully balances the local interest and the national interest in the way the District of Columbia is governed." The council is composed of thirteen members, each elected by District residents to a four-year term. One member is elected from each of the District's eight wards. Four at-large members represent the District as a whole. The chairman of the council is likewise elected at an at-large basis. The terms of the at-large members are staggered so that two are elected every two years, and each D.C. resident may vote for two different at-large candidates in each general election. According to the Home Rule Act, of the Chair and the at-large members, a maximum of three may be affiliated with the majority political party. In the Council's electoral history, of the elected members who were not affiliated with the majority party, most were elected as at-large members. In 2008 and 2012, Democrats such as David Grosso, Elissa Silverman, and Michael A. Brown changed their party affiliation to Independent when running for council. 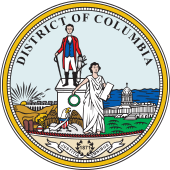 To become a candidate for Council an individual must be resident of the District of Columbia for at least one year prior to the general election, a registered voter, and hold no other public office for which compensation beyond expenses is received. If a candidate is running for a particular ward seat, he or she must be a resident of that ward. Like other legislatures, the Council has several standing committees and a full-time staff, including a council secretary, auditor, and general counsel. Given the limited number of council members, nearly every member of the council has, in effect, the opportunity to chair a committee. Commentators have questioned the legislature's structure noting that with 13 members nearly any piece of legislation can pass with just seven votes, leading to accusations that the Council can too easily overreach in its powers. However, this unique governing structure has also allowed the Council to operate more efficiently in comparison to some state legislatures with regard to consideration and passage of laws. As of December 2018, the eight ward and four at-large council members receive an annual salary of $140,161, while the Council Chairman receives an annual salary of $210,000. According to a 2011 article in The Washington Post, the DC Council were the second-highest-paid local representatives of large cities in the United States. ^ "Georgetown Historic District". National Park Service. Retrieved 2008-07-05. ^ "History of Alexandria, Virginia". Alexandria Historical Society. Archived from the original on 2009-04-04. Retrieved 2008-07-31. ^ Kulyk, Nathaniel (October 3, 2005). "Nelson Rimensnyder". Ruth Ann Overbeck Capitol Hill History Project. Retrieved August 12, 2011. ^ Dodd, Walter Fairleigh (1909). The government of the District of Columbia. Washington, D.C.: John Byrne & Co. p. 4. ^ Leubsdorf, Carl P (August 10, 1967). "Government Reorganized for District of Columbia". Nashua Telegraph. Associated Press. p. 2. ^ DeBonis, Mike (February 7, 2011). "Why does the D.C. Council have 13 members?". The Washington Post. Retrieved August 13, 2011. ^ a b c "District of Columbia Home Rule Act". Government of the District of Columbia. February 1999. Retrieved 2008-05-27. ^ a b "Home Rule Bill for D.C. Signed". The Miami News. Associated Press. December 24, 1973. ^ "History of Self-Government in the District of Columbia". Council of the District of Columbia. 2008. Archived from the original on 2009-03-31. Retrieved 2009-01-02. ^ "D.C. Code 1-221(d)(3)". Notwithstanding any other provision of this section, at no time shall there be more than three members (including the Chairman) serving at large on the Council who are affiliated with the same political party. ^ "Organizational Structure". Council of the District of Columbia. Retrieved August 13, 2011. ^ DeBonis, Mike (February 3, 2011). "Is D.C. overgoverned? Or undergoverned?". The Washington Post. Retrieved August 13, 2011. ^ "DC Government Employee Listing" (PDF). District of Columbia Department of Human Resources. September 30, 2018. Retrieved December 31, 2018. ^ "D.C. mayor, council chair and attorney general would get $20,000 raises with new bill". Washington Post. Retrieved December 31, 2018. ^ Craig, Tim (February 2, 2011). "D.C. Council Salaries are second-highest among big U.S. cities". Washington Post. Retrieved June 29, 2017.